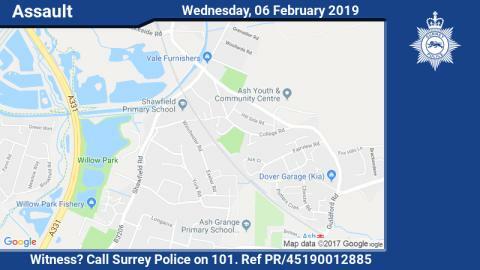 We are appealing for witnesses after a woman was assaulted outside Shawfield Primary School in Winchester Road, Ash, yesterday afternoon (5 February). A further disturbance then occurred along Winchester Road during which vehicles were damaged. Officers quickly attended and a 32-year-old man from Ash was arrested on suspicion of assault causing actual bodily harm. A 28-year-old woman from Ash was also arrested on suspicion of affray. Both are still in custody at this time. Guildford Borough Commander Inspector Andy Hill said: “The incident unfortunately occurred as parents and children were leaving the school but we would like to reassure the community that the school was not involved and that there no risk to the wider public. The school is open as normal today (6 February), and extra officers will be patrolling the Winchester Road area to provide reassurance during school drop off and pick-up times. If you have any information, please call us on 101 (999 in an emergency) or http://surrey.police.uk/TellUsMore quoting reference PR/45190012885.